At the moment, I’m preparing for a new adventure. Given all continues to move happily forward as it has these last several days, I will be taking my mobile mini-mansion gypsy cabana, aka: 2002 Great West Van Classic Supreme Elite (nicknamed ‘Louise’ in honor of my middle name because this ride is all about me <grin>), on her debut run. Thanks my darling adult kinder, 2 1/2 weeks ago I became the owner of this wonderful vehicle and the recipient of a whole bunch of moral support for me to follow my dreams. 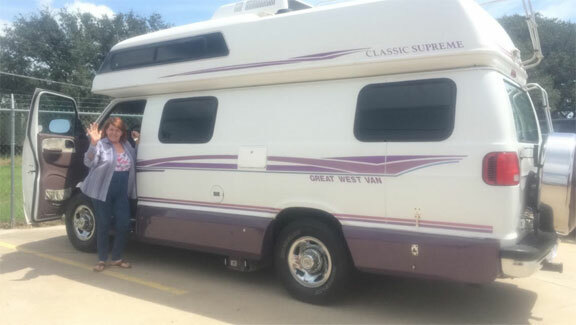 And for the last 5 years, all I have been plotting and hoping and planning and wishing to have is a little motor home, so that I can travel around and visit with family and friends that I have not seen in forever or, in some instances, never met before…!!! So for since we returned from (near) Corpus Christi, Texas, where be purchased this stellar vehicle from Ron Hoover RV & Marine (THANKS!!! Y’all are great!!! ), I have been busy testing systems, outfitting, provisioning and getting things ready to go on this first run. And yesterday, thanks to my eldest son, Adam, the water leak that had me concerned was diagnosed as a crack in the filler hose that attaches the potable water inlet to the potable water tank. Though I do want to get this fixed, it is not an immediate concern and is fine to travel as is. We also checked the electrical systems and found that everything is working fine, EXCEPT that the engine alternator is NOT charging the coach batteries (which we were told when we purchased, but wanted to confirm). And while I do want to get this fixed as soon as possible, since the generator, 12v, shore power and propane systems are all working fine, this is not an issue that will keep me from traveling this week. So tomorrow I will do the final load-up of clothing, computer stuff and provisions, and continue double-checking systems, so that Friday morning between 8 and 9 am (Central Time), Louise and I will be heading north (about 300 miles) to St. Louis, Missouri, to visit for a couple of days with a friend. And depending on how well things go on the 1st leg of this journey, I will decide whether I am best to head back home, or go on to Lexington, Kentucky for a day or two. Ahhhhhh… sweet mystery of life…. (((hugs))) ~Christine, more about me at About Me !! !